Etc...: Etc... Restaurant and Lounge. 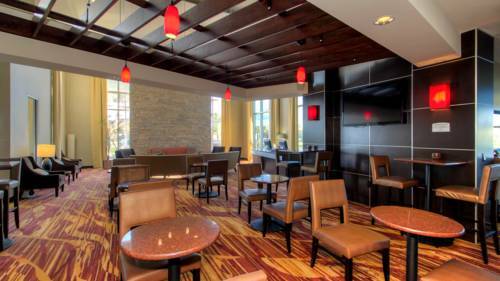 Our newly designed restaurant will take care of you and your family with a full menu for both breakfast and dinner. Breakfast buffet also available for purchase for those quick guests on the go. Applebee's: Open for lunch and dinner daily. Applebee's is located just next door to the hotel. Willow Creek Grill: Offers salads, sandwiches, soups and sushi. Restaraunt with local feel. Cottonwood Grill: Upscale restaurant open for lunch and dinner. Patio dinning available in the summer along the Boise River. Bardoney: Great sandwiches, salads, pasta, entrees and full service bar. Distillery. Mai Thai: Modern Thai food and sushi. Etc...: Etc... Lounge open evenings. Enjoy from our fulll service bar. Applebee's: Full service bar located right next door. Sawtooth: The Sawtooth is our largest meeting room at 1325 sq. ft. It is able to be divided into two sections. The room has a drop down screen and high speed internet access - complimentary for both. Boise Towne Square MallMulti store mall with Macys, Dillards, Kohls, JC Penny, Sears as anchors. Just located 3 miles from the hotel. Indian Lakes Golf CoursePublic nine hole course. Fairways are lined with mature trees. Warm Springs Golf CourseWarm Springs Golf Course is located just a few miles from downtown Boise. The course plays at the base of the foothills with some holes running along the Boise River making the scenery on this course very enjoyable. Boise State UniversityBoise State University is the major four year university in town. BSU is know for its blue football turf and the Bronco's football team!! Taco Bell ArenaTaco Bell Arena is located on the Boise State University campus. Basketball, gymnastics, indoor volleyball and other sporting and entertainment events are held here. Taco bell is just 2 miles from Holiday Inn. Morrison Center for Performing ArtsMorrison Center for the Performing Arts is Boise's most prestigious performance complex, nestled on the back of the Boise River on the Boise State University campus. Opera, ballet, Broadway productions and other numerous events are held at this center. Boise Towne Square MallBoise Towne Square Mall is our valley's major mall. Anchor stores include Macy's, Dillards, JC Penny, Kohl's and Sears. There are numerous speciality stores and restaurants including the Cheesecake Factory. Zoo BoiseVist our local zoo. Exhibits and specials year round. Located in Julia Davis park, this zoo has a lot to offer families. Boise Art MuseumThe Boise Art Museum is always changing. Come see our feature exhibits, buy custom made jewelry and enjoy the day. CenturyLink ArenaCenturyLink Arena is ldaho's premier professional sports arena. It is located right in downtown Boise just steps away from shopping and dinning. Events held here include the Idaho Steelheads ice hockey games, Front Street Fights, concerts and more. Boise CentreIdeally located in heart of downtown, the Boise Centre is within walking distance of numerous restaurants, museums, shopping and entertainment venues. This facility is Boise's convention center and can host groups to 2900 people. Downtown BoiseDowntown Boise is the heart of the city. Visit the many restaurants with outdoor patio dinning along 8th Street. Musical venues, night clubs and shopping abounds in our vibrant downtown. Idaho CenterThe Idaho Center and Horse Park, is one of the most versatile and accessible facilities in the west. Conventions, sporting events - including the Snake River Stampede, concerts, equestrian events, trade shows and more are held at this facility. Bogus Basin Ski ResortGreat skiing or snowboarding day or night. This mountain has 76 runs, 7 chairlifts, nordic skiing, rentals and lessons. Idaho Botanical GardenThirteen theme gardens set along the Boise foothills. Enjoy beautiful flowers native to the area. In winter, vist it for Winter Garden a Glow when the gardens are strewn with thousands of lights. Idaho Ice WorldIdaho Ice World is Boise's premier indoor skating facility. Enjoy ice skating with the family or check our schedule for indoor ice hockey games. Learn to skate - lessons available. Basque Museum and Cultural CenterOriginal Basque boarding house. Exhibits show basque culture's impact on Idaho.